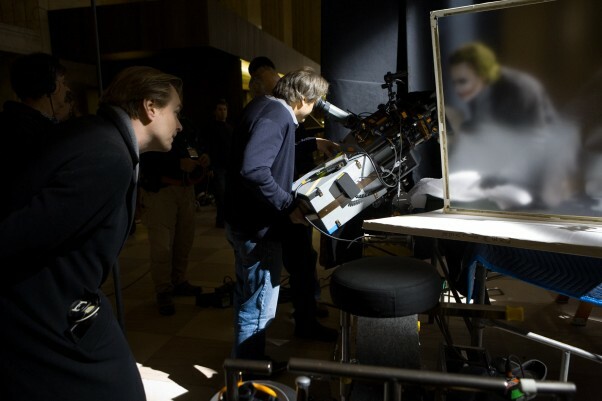 Nolan talks Batman in IMAX + new Joker photo! USA Today has posted another photo! Click it for IMAX size! You can see Heath in full Joker garb to the right of the shot! He looks evil and awful and terrifying and amazing. I like how they’re teasing us by taking the photograph in a way that he’s blurred by the teller window. I love this movie already. YES! News about The Dark Knight just keeps rolling in! USA Today just published this article about how Christopher Nolan is shooting four big scenes from his new Batman movie in the super-awesome, utterly (and literally) massive IMAX format. One of the scenes is the introduction of The Joker, played by Heath Ledger. He goes on to say he wishes he could shoot the whole movie this way. The article also has a new picture of Heath Ledger as The Joker, but he’s wearing a mask. But don’t worry or think that they’re taking some kind of cheap route for the character. Because under that mask, he looks like this. I need it to be July 18, 2008, like, tomorrow.